Are you interested in living - either full time or seasonally - in a scenic, rural location? Perhaps you are looking to make secure investment, realizing that the value of waterfront real estate is protected by the limited quantity available. If you love the ocean - fresh salt air and big skies, or yearn for your own special spot where you can watch the sunset - our selected properties may be of interest to you. Broad Cove Contractors Ltd. constantly searches for desirable, accessible and reasonably priced land on and near the water in southwestern Nova Scotia. We specialize in waterfront property on the world famous Bay of Fundy, one of the very few locations on the east coast of North America where the sun sets directly into the ocean in a blaze of glory. 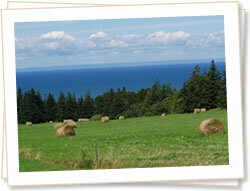 The Bay of Fundy boasts the largest tidal range in the world, and brings in clear, cold waters rich with feed. Fishing is still a way of life here, and fresh lobsters, scallops, and fish await your dinner table. This is the summer feeding ground for twenty seven species of whales, and hundreds of species of migratory birds stop here to rest and feed. This area of southwestern Nova Scotia remains relatively undeveloped and unspoiled, providing an affordable, high quality lifestyle. The Annapolis County area is 35 minutes from Digby and the ferry service to New Brunswick, and travel to the Halifax International Airport or the capital city of Halifax is just over 2 hours. Broad Cove Contractors Ltd. is familiar with the provincial rules and regulations regarding development along this coastline and the Annapolis County guidelines for permitting and building. We are available to manage the improvement of your selected property, from cutting the initial road into your land all the way through to the year round maintenance of your home or seasonal rental property. If you are interested in sharing in a part of this beautiful little corner of the world, or have a property that you would like to list with us, please contact us at your convenience.